The new addition built onto my house three years ago added a feature that my house had never had before – gutters and downspouts. At one corner of the house, near the entrance, I installed a 50-gallon rain barrel under the downspout and attached a small length of hose which allows me to channel rain water into nearby plantings. By the other downspout, at the west corner of the house, I decided to create a small rain garden. A rain garden is a strategically placed depression in the ground designed to collect and slowly drain rain water and planted with water-tolerant plants. 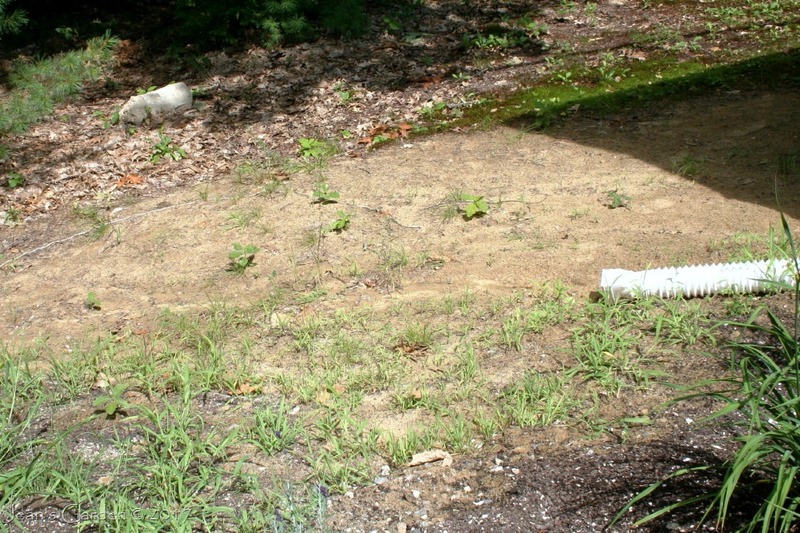 I don’t actually need a rain garden; my excessively well drained sandy soil slopes away from the house in all directions. Even in the heaviest downpours, water never pools for more than a few minutes. But my hope was that, by creating a depression that can collect and concentrate rain water, I might be able to grow the kind of moisture-loving plant that I normally can’t provide the right conditions for. I had my heart set on a hydrangea. Last year I did some research on rain gardens, reading both a book on the technical details and the University of Maine Cooperative Extension’s advice. The technical book helped me figure out the appropriate size for my rain garden, which turned out to be very small – a mini rain garden, big enough for one hydrangea. This year, I set out to execute my rain garden plan. My first step was to install a 4’ long flexible extension on my downspout to channel water from the roof in the proper direction. 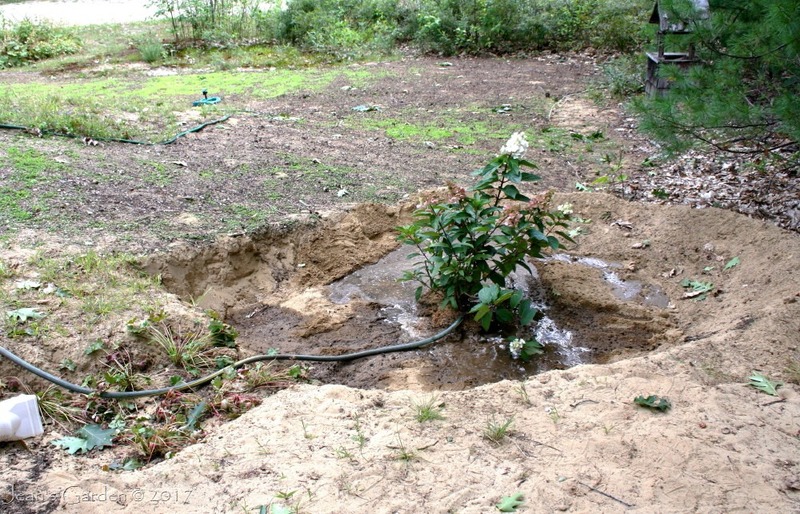 Next, I created a shallow swale to carry the rain water to the lip of the rain garden. I planted some divisions of Geranium x cantabrigiense ‘Biokovo’ in the swale and also along both sides of the downspout extension. This is a groundcover that spreads quickly and grows about one foot high. It should provide an attractive lining for the swale, and my hope is that it will help to camouflage the ugly downspout extension. With that done, it was time to actually dig out the depression for the rain garden. Because the bottom of the rain garden should be flat, the standard advice is not to build it on a slope, but I didn’t have a choice. 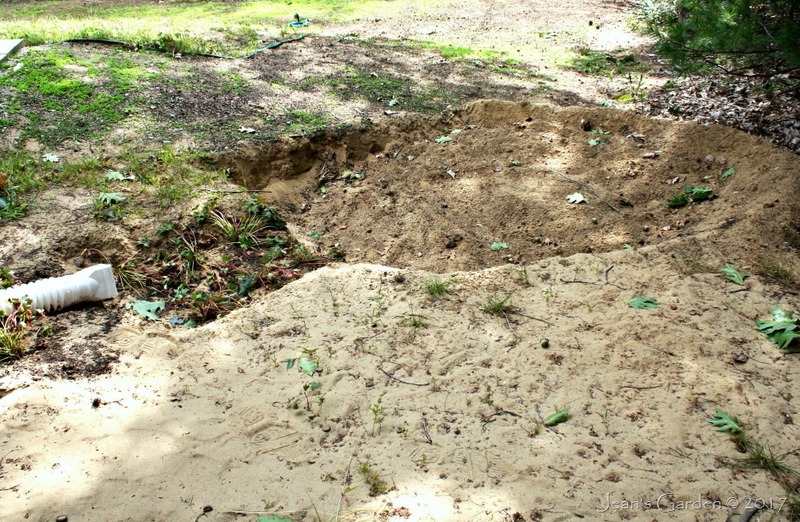 This meant that, in order to have the downslope side be at least six inches deep, the upslope side needed to be about two feet deep. I used some of the soil I was removing to create a six inch high berm around the downslope edges of the rain garden. 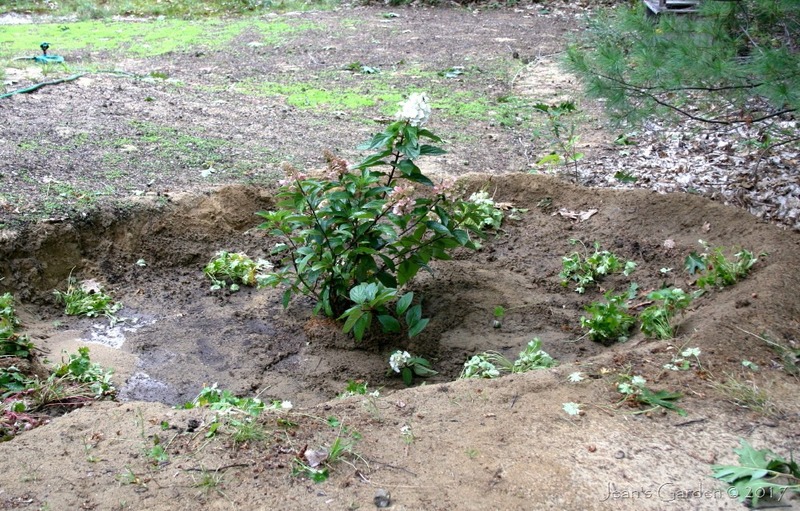 I dug the hole for the hydrangea, filled it with water, and let it drain before putting in the plant and backfilling. Then I watered it thoroughly again. The hydrangea will eventually grow to largely fill this rain garden space, but I don’t want weeds covering the ground around it. Once the hydrangea was in place, I planted more of my groundcover geranium ‘Biokovo’ (a plant of which I have an almost infinite supply), putting in divisions around the circumference of the rain garden floor, and adding a few more in the side near the top lip on the upslope edges. These plants will grow toward each other and toward the hydrangea, probably forming a solid ring around it within 2-3 years. I also hope it will grow upward along the sides of the rain garden, stabilizing the soil and maybe even spilling out a bit over the top. As an added bonus, this attractive groundcover sports lovely pink and white flowers in June that will anticipate the colors of the hydrangea blooms. We have rain forecast for later today, which will provide a chance to see how well my mini rain garden does in collecting rain from the roof.